Unlike most Sydney kitchen companies, we manufacture your kitchen cabinets in our own factory here in Sydney. This gives us complete control over quality, production & timing so you get a better kitchen, faster. We specialise in residential kitchen design, luxury kitchens, wardrobes, vanities, entertainment units and other custom joinery. Whether you’re planning ahead or you’ve already started renovating, we’ll help you create a stunning, functional kitchen design and get it done in the most cost effective way possible. All of our kitchens are manufactured in our own factory in Sydney, fully custom built to suit your space perfectly and backed by our 10 year warranty. Our experienced team of kitchen designers excel in the industry, having designed and renovated thousands of beautiful kitchens in homes all over Sydney. 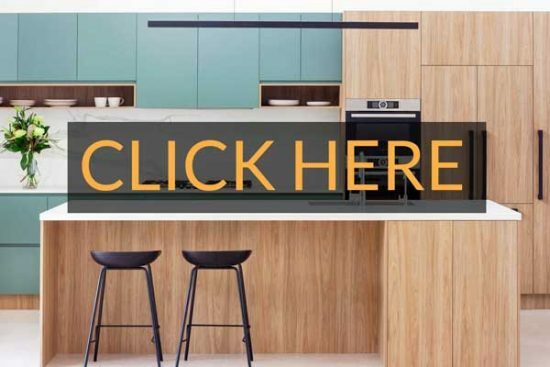 Always up to date with industry trends, you can rely on them to make the best recommendations to suit your needs, whilst offering the very latest in modern kitchen design products, hardware and finishes. Book a complimentary kitchen design consult today. Our cabinets are fully custom built to maximise storage space and to ensure they meet the standard size requirements for the latest appliances, sinks and tapware on the market. We offer high quality kitchen appliances, sinks and tapware from well known brands such as Caroma, Clark, Teka and more. We also offer quality benchtop surfaces using Caesarstone, Quantum Quartz, Corian, Neolith and more. The first step is to book your complimentary design consult with one of our kitchen designers who will come to your home and discuss your needs. After the initial meeting, we’ll invite you to visit one of our kitchen display showrooms where we’ll show you some 3D design drafts of your kitchen, discuss products, materials and finishes and provide you with a quote. From here if you feel comfortable that we are the right fit for you, we sign you up and start the production process. All our kitchens are backed by our best price guarantee and can be delivered in just 3 weeks from sign off. Read more about our kitchen design process.